Keeping evil spirits at bay has long been an Asian challenge. Throughout the centuries, evil spirits, bad luck and negative karma have been of serious concern to Okinawans, who developed ways of blocking the bad vibes. Island locals have seized upon shiisa as a principal way of dispelling evil. 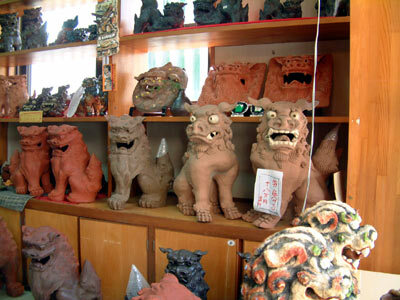 Shiisa are lion figures, which Okinawans trust to cast away evil spirits. Shiisa are the most recognizable of Okinawa’s physical markers against the world’s evils. Two other common methods of repelling bad spirits are himpun and ishiganto. Like shiisa, himpun and ishiganto are steeped in Chinese history, tradition and myth. Himpun, which means partition or fence, is found in traditional Okinawan homes. A himpun is placed horizontally across the entranceway to the home, blocking visitors from direct access. Stemming from the Chinese words ping-feng, himpun serve as partitions or barricades to prevent outsiders from looking inside a home. Aside from the pure physical move of stopping prying eyes, tradition dictates that the himpun wards off both intruders and evil spirits lurking in the neighborhood. The himpun are typically built of stones, then topped with a traditional Okinawa tile roof or a combination of woods and well trimmed hedges. The ishiganto, simple stone tablets engraved with three Chinese characters, serve notice to evil spirits to stay away. The characters ishi, meaning stone, gan, which issues a challenge or a dare to outsiders, and tou, meaning hit, are emblazoned onto the tablets. Ishiganto found their way to Okinawa from China more than five centuries ago. By Chinese folklure, evil spirits are limited to movement only in straight lines. Because of the way homes are constructed, ishiganto are essential in keeping evil spirits from wandering inside. The ishiganto are traditionally made from stone, although some carved from wood can also be found around Okinawa. There’s also a Chinese tale that a brave warrior named Ishiganto had the power to alter evil actions or bad luck into positive omens. For that, Chinese families carved his name on the tablets and put them outside their homes for protection. Shiisa, the lion dogs, are most popular and commonly seen across Okinawa. As with much of Okinawa’s history, shiisa eminated from China, where a vile monster, Nien, terrorized the countryside centuries ago. Neither humans nor animals could defeat the monster in battle after battle. Finally, a lion whipped the monster and sent him fleeing. Years later Nien returned, and villagers were forced to create imitation lions to scare the monster away. The shiiisa, lion dog, was created. Traditionally, the shiisa are in pairs, one on the left of the protected area and the other on the right. One has an open mouth to attract positive spirits and good fortune, and the other a closed mouth, admonishing evil spirits to stay away. Shi-shi dogs, as they’re happily referred to by Okinawans, are a positive influence to locals, and also to tourists. They’re found in all shapes and sizes, and some artisans go the extra steps to make theirs artistic and special. Naminoue Shrine and the Okinawa Prefectural Museum are well known for their shiiisa, but you’ll find them everywhere from RyukyuMura and Gyokyusendo theme villages to the smallest of neighborhoods. The red clay animals once adorned the roofs of virtually all buildings, but as the red tile roofs began being replaced, the shi-shi dogs found their way to alternate locations around the buildings.